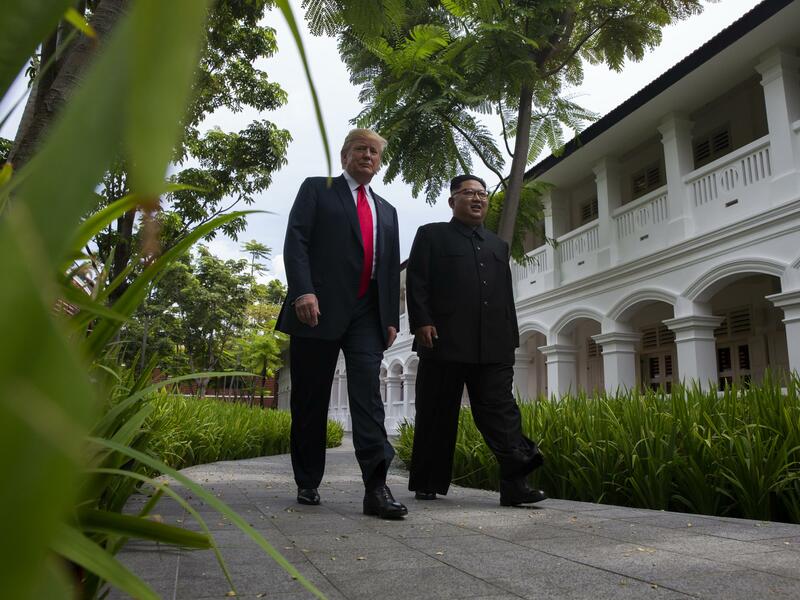 President Trump walks with North Korean leader Kim Jong Un on Tuesday on Sentosa Island in Singapore. 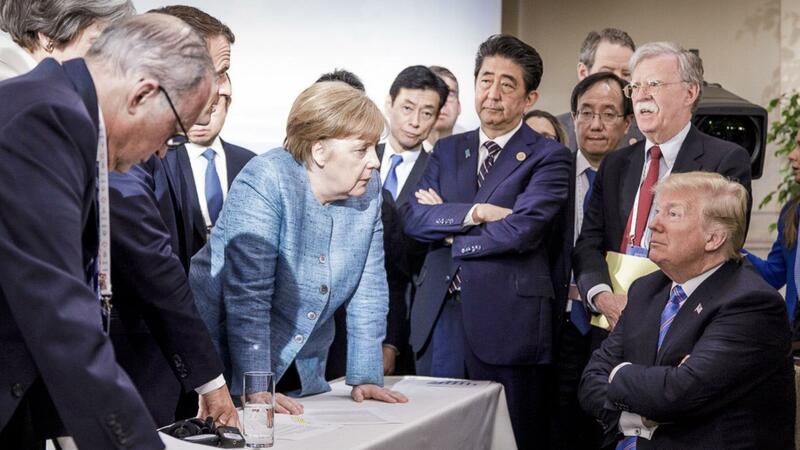 In this photo made available by the German Federal Government, German Chancellor Angela Merkel, center, speaks with President Trump, seated at right, during the G-7 Leaders Summit in La Malbaie, Quebec, Canada, on Saturday, June 9. North Korea's leader Kim Jong Un heads a brutally oppressive regime. But since meeting face-to-face with Kim, President Donald Trump has had kind words for the dictator. "Well, he is very talented. Anybody that takes over a situation like he did, at 26 years of age, and is able to run it, and run it tough — I don't say he was nice or I don't say anything about it — he ran it," Trump told reporters at a press conference in Singapore Tuesday. Trump's embrace of Kim stands in sharp contrast to the harsh language and threats he has lobbed at Canadian Prime Minister Justin Trudeau in the aftermath of the G-7 summit, which wrapped up shortly before the Trump-Kim talks. There seems to be a thin line between friend or foe, at least rhetorically. That dynamic has put longtime U.S. partners on the receiving end of tongue lashings, while some historic opponents of the U.S. have gotten flattery. "He's turned the traditional foreign policy world upside down," said Stewart Patrick, a fellow at the Council on Foreign Relations and author of The Sovereignty Wars: Reconciling America with the World. "He appears to be withering in his views of longstanding U.S. allies who have stood by the United States for more than seven decades. What he's doing is unprecedented," Patrick said. As president, Trump stresses the importance of personal interactions and seems less focused on broader geopolitical ties. In practice, this means that a country's standing can change quickly with Trump. Before he was complimenting Kim, he was warning him about "fire and fury" and calling him "rocket man." Trump says he has toned down his language toward North Korea in hopes these direct talks will help to avoid a conflict that could put millions of lives at risk. In a tweet Tuesday night, Trump said, "The World has taken a big step back from potential Nuclear catastrophe! No more rocket launches, nuclear testing or research! The hostages are back home with their families. Thank you to Chairman Kim, our day together was historic!" In the lead up to the G-7, which was hosted by Canada, Trump slammed Trudeau and French President Emmanuel Macron on Twitter, saying their countries were treating the U.S. unfairly when it came to trade. At the summit, he held one-on-one meetings with both men. Though he exchanged pleasantries with both, the niceties quickly dissipated on the final day of the gathering. Trump abruptly pulled out of signing a joint statement that the U.S. had helped to negotiate with the rest of the group's members after he took offense at Trudeau's closing press conference. On Twitter, Trump called Trudeau "weak" and "dishonest." Trump's complaints against Trudeau continued during his press conference in Singapore. "That's going to cost a lot of money for the people of Canada. He learned. You can't do that," Trump said. He also took a shot at South Korea over the costs of joint military exercises the United States has carried out with the country in the past. "The amount of money that we spend on that is incredible," Trump said. "And South Korea contributes, but not 100 percent, which is certainly a subject that we have to talk to them about also." He cited that expense as part of the reason the U.S. was withdrawing from the war games. Trump has repeatedly complained that U.S. allies are not pulling their weight when it comes to military spending. Last year at a NATO summit in Brussels, Trump scolded the other members of the alliance for not devoting enough resources to defense funding. While Trump has griped about allies, he has faced criticism at times for his willingness to reach out to countries who have had adversarial relationships with the United States. At the G-7 this year, Trump called for Russia to be re-admitted to the group, which was once the G-8. Russia was removed from the group after it annexed Crimea from Ukraine. Trump did condemn Russia over the poisoning of a former Russian spy in the in the English city of Salisbury earlier this year and the U.S. expelled dozens of Russian officials over the incident. But Trump still congratulated Russian President Vladimir Putin for winning re-election in a contest that reportedly involved forced voting. He also talked with Putin about visiting the White House. Asked about the perception that he has been nice to U.S. enemies and tough on allies, Trump defended his diplomacy. He argues he has great relationships with other leaders, but he believes the U.S. has been treated unfairly. "Here's what the story is: We have been taken advantage of as a country for decades by friends and enemies both," Trump told ABC News on Tuesday.